This Saturday saw my oldest son and I engage in an activity that cannot be done in the United States until Friday, May 4. For whatever reason known only to Paramount Pictures, the motion picture of the Marvel Comics superhero team-up, The Avengers, was released internationally, including here in Peru, a week before its premiere in the United States. I don’t know why Paramount did this, but I am not complaining in the least. It was a rare privilege to be able to see something before folks in the States could. Marketed in Peru as Los Vengadores, we saw this movie with sub-titles so that I would be able to follow all the dialogue. We also saw the film in 3-D. Now, when watching movies in the third dimension in the States with those quirky glasses, the admission usually involves an installment plan. However, here in Peru, the cost for the movie was only S/. 25, which comes out to about $9.50. Not that bad a deal. Likewise, a bucket of popcorn and a mega-size 54-ounce cup of soda sold for S/. 20 ($7.60). The prices were not the only things that made this cinematic experience different from that in the States. Given that The Avengers has been anticipated for some time and has been in the news for weeks before its release (yes, even here), we arrived at the theater long before the start time so that we could beat the crowd. We certainly didn’t want our movie to be sold out. I was expecting long lines that normally accompany a blockbuster movie. I am not the first to make note that Peru does not necessarily have a culture of waiting in line for movies (although Peruvians will wait in line for other things), but again I am not complaining over this lack of crowds. When we arrived at the theater, it was one fluid motion from buying the tickets, purchasing the snacks, grabbing our glasses, and being the first ones in the theater. All in all, for a Saturday afternoon viewing of The Avengers, the theater was half-full. Not that I am complaining in the least. As for a review for the movie, I will hold off on that. As much as I would love to critique the movie, I don’t think it’s fair for me to talk about a cinematic event before you Stateside folk have had the chance to see it. We can talk next week and trade notes if you’d like. 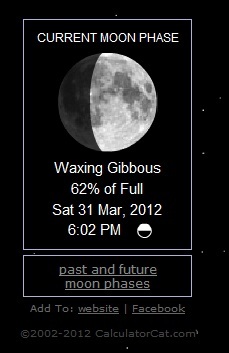 However, I will offer this: this prediction by the webcomic Gutters will probably be on the mark. Together is the theme of this week’s photo challenge from WordPress. My photographic offering for the theme once again takes me to our February outing to the Peruvian portion of the Amazon jungle (previous posts include here and here). On this Sunday in particular, the family and I went to an animal rescue center. In addition to an ark’s worth of animals that we saw (and honestly, one day, I will post a plethora of pictures from that visit), there was one particular monkey that stole the show for us. The monkeys at this rescue center are accustomed to having people around. They have no fear around humans and are quite happy to approach people and even jump on them as if they were trees. One monkey took a shine to my lovely wife and would not let go. 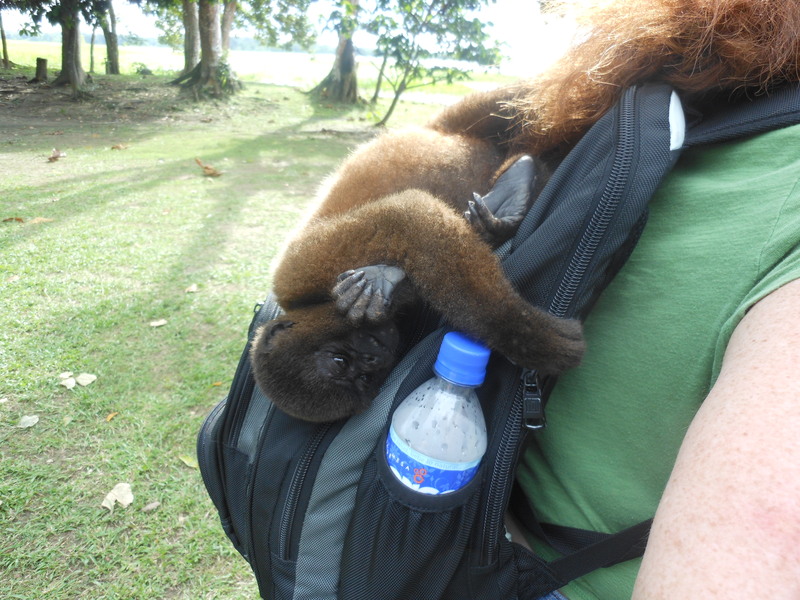 Every time one of the center’s staff would extricate the monkey, it would jump right back on her. This off-again-on-again routine took place for about ten minutes and was only stopped when we boarded our flat-bottom boat to leave. Not that our departure deterred the monkey…but that’s a story for another day. From Photo Friday, this week’s photographic theme is “Portraiture“. Rather than offer up a portrait of my countenance, let me show you an artifact I saw during my Spanish class outing to Museo Larco, a museum located in Lima that specializes in pre-Columbian art. More information about this wonderful museum can be found here. My apologies if I do not label this artifact correctly. I believe it comes from the Nasca culture. 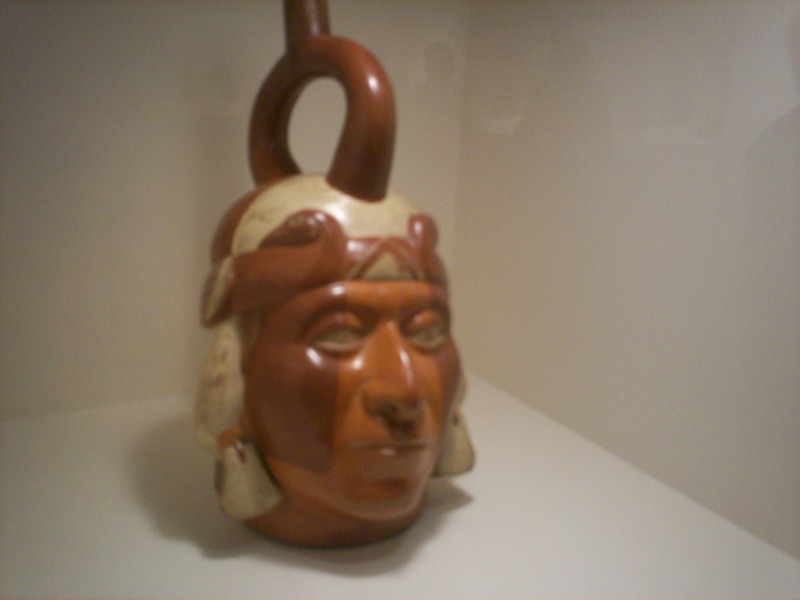 It is a piece of pottery that was of a traditional design among the pre-Columbian cultures of Peru. It is a vessel to hold liquid and the spout is quite distinctive. Archeologists (I believe…and I could be way off base here) can actually date the time period of a pottery piece based on the design of its spout. What impressed me more about this particular piece of pottery was its incredible life-like visage. To me, it almost appears that someone, many centuries ago, sat patiently while the artist sculpted their face into clay. However, it can also broaden and expand a person’s knowledge of history. Time to play a game of word association. Please tell me what is the first thing that comes to your mind when I say, “1941“. a) The attack on Pearl Harbor, which happened on December 7 of that year. This event prompted the United States’ entry into World War II. b) A video arcade game featuring WW II bombers. This game prompted the entry of many quarters by kids in the 1980s. c) A movie directed by Steven Spielberg and starring John Belushi, Dan Aykroyd, and Christopher Lee (among others). This film features a scene that ends with the entry of a ferris wheel into the Pacific Ocean (and all done without CGI). What I am postulating is that none of you thought of was the war between Peru and Ecuador fought in the month of July during the year of 1941. I only found out about this conflict courtesy of a walk I took in a nearby park. In that park, I saw this obelisk. This four-sided structure has plaques on each side. 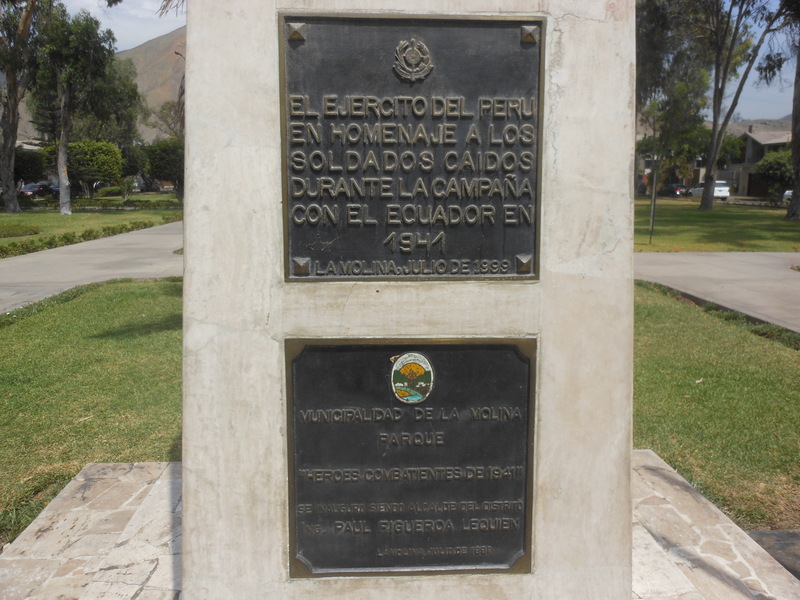 The top plaque reads “The army of Peru in tribute to fallen soldiers during the campaign with Ecuador in 1941”. 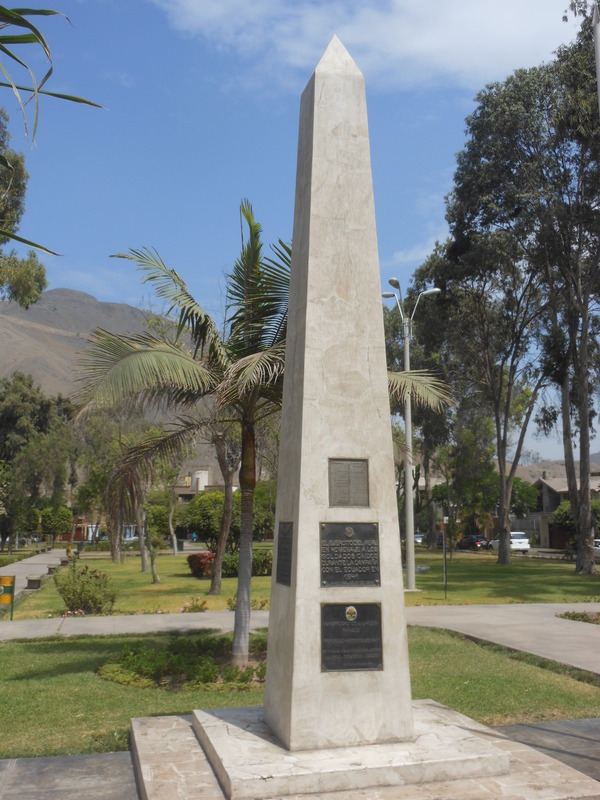 The bottom plaque is from the 1999 dedication of the monument from the city of La Molina to the combat heroes of 1941. According to the Wikipedia article I linked to above, the 1941 conflict between these two neighboring South American countries dates back to 1840 and it revolved around a border dispute. From 1938 to the war’s start, Peru and Ecuador mobilized their forces to the border and the occasional skirmish broke out. The Peru-Ecuador War had a skirmish that goes by the name of the Zarumilla Campaign. 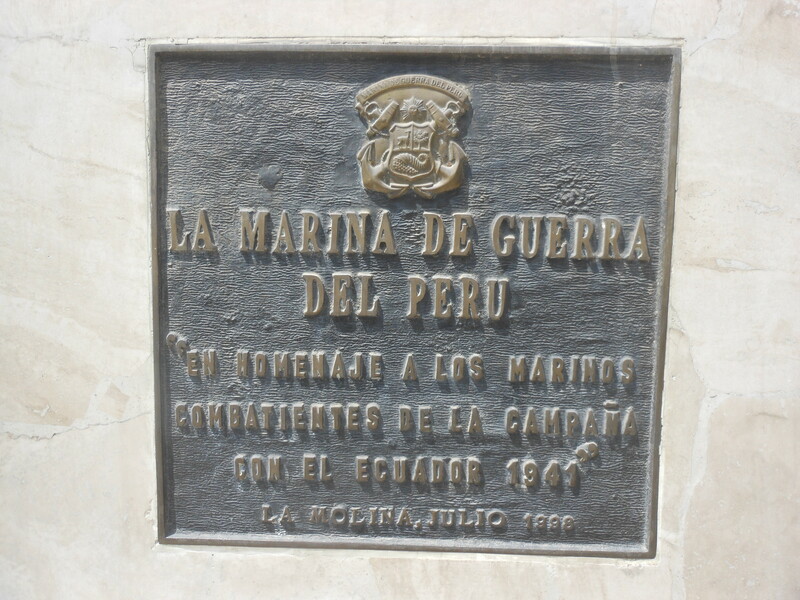 The Peruvian Navy took part in that campaign (and I’m guessing in other battles also). 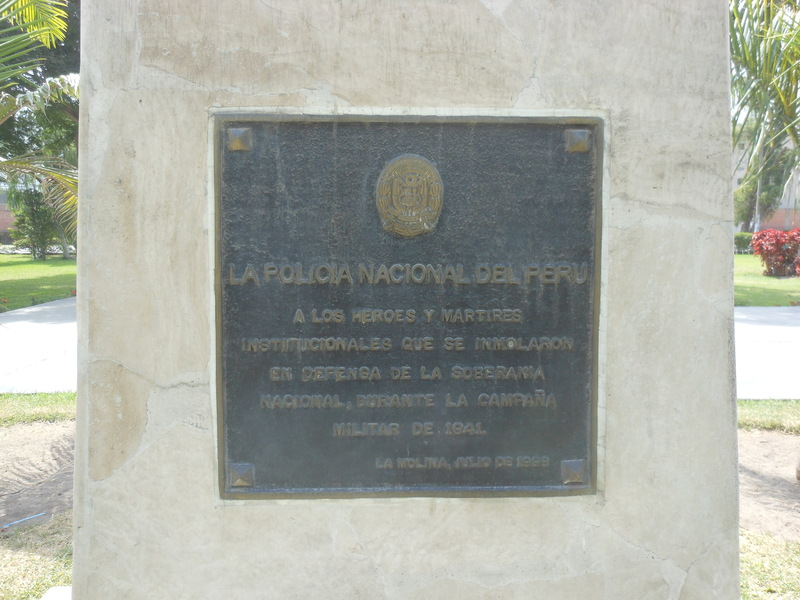 For that reason, the plaque above honors the Peruvian Navy. The previous three plaques all honor groups of people. 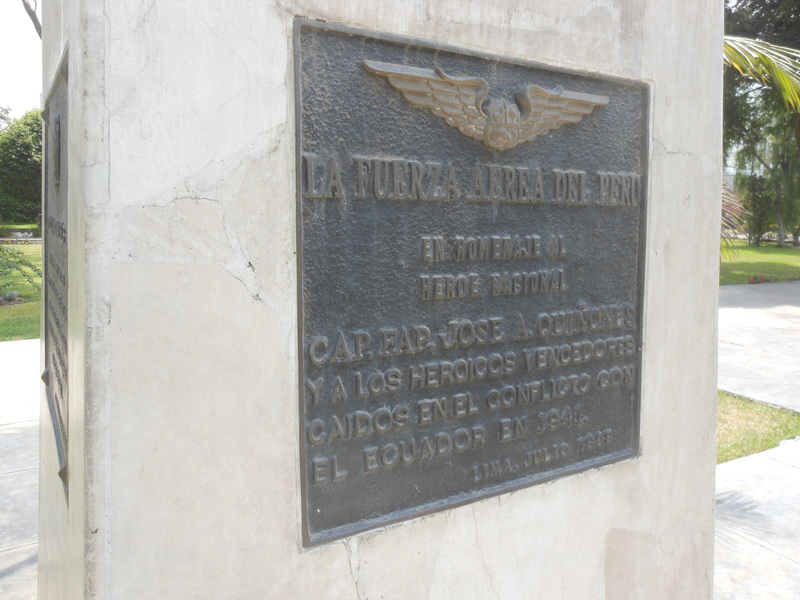 The last plaque to be pictured also honors a group (the Peruvian Air Force), but it is unique in that it also honors a single man. You have read about Jose Quinones Gonzales previously in this blog as he is the gentleman featured on the 10 nuevo soles bill. During the latter part of the war, while flying over an Ecuadorian anti-aircraft battery, Quinones’s plane sustained damage. He is considered a national hero for his sacrifice by crashing his plane into the Ecuadorian position. Looking at this obelisk, it made me realize how narrow my view of the world actually is. Whenever I heard of the year 1941, I always thought of Europe and Asia at war with the Allies fighting the Axis powers in the global conflict known as World War II. The year 1941 also meant Pearl Harbor. That’s what I was taught in schools. That’s what I thought the whole globe thought of if asked about the year MCMXLI. Turns out, the world is a great deal larger than I thought. The 1980s are big here in Peru. Radio station play their music. It’s piped in to the local grocery stores. Bands of that era come to the City of Kings (i.e., Elton John, The Smiths, Aerosmith, Erasure, Roxette). The 1980s are big here in Peru, but I have found another decade that lives on the airwaves. Completely by accident (and the short version of the story is I overheard it while my daughter was at a roadside kiosk making a painting for the low, low price of S/. 2), I discovered Radio Magica 88.3 FM which has the tagline of “Disco de oros en ingles” (Golden oldies in English). This is a radio station, located on the left-hand side of the dial that is in the United States reserved for National Public Radio, that plays mostly hits of the 1970s and a smattering from the 60s and 80s. Eighty-eight-point-three on the FM (which, by the way, stands for Frequency Modulation) dial is where I can now hear Billy Joel (the pre-Christie Brinkley Mr. Joel), Glenn Campbell, Barry Manilow, Karen Carpenter, Kenny Rogers, the Beatles (the Mop Top version of the Fab Four), and KC & the Sunshine Band. Other than having the opportunity of hearing “Close to You” or “Copacabana” again and relive those fond aural memories, I can listen to the radio and not have to worry about F-bombs like I do with other stations. When in the car and listening to my favorites 80s station, Oxigeno, I will sometimes teach my three kids about the 1980s music that we hear (The Police, The Who, Eagles), which leads to some interesting discussions (“Really, Papi, the lead singer of Twisted Sister is a guy even though he sounds like a girl”). Now I have a whole new decade of music that I can teach them about. I can’t wait to show them the YouTube videos so they can see what disco really looked like. Sun is the theme for this week’s Photo Challenge from WordPress. 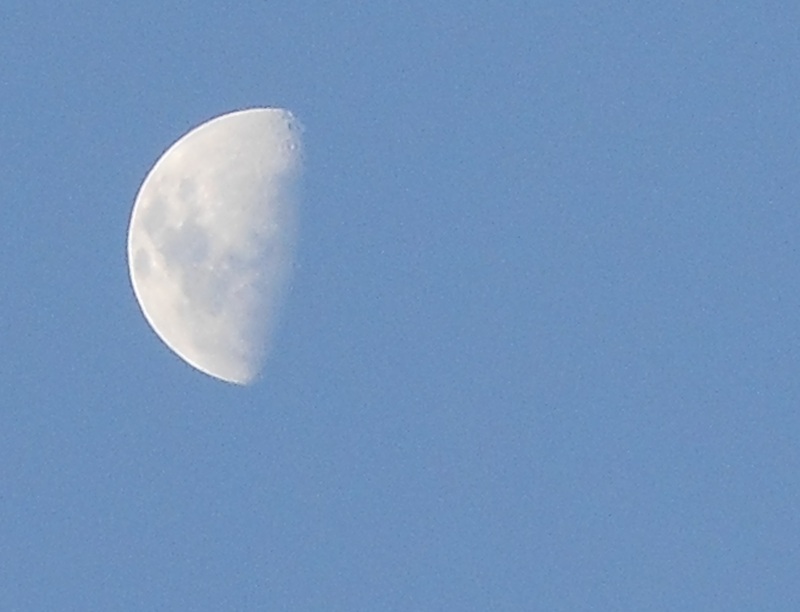 This post is an experiment in compare-and-contrast with photography. 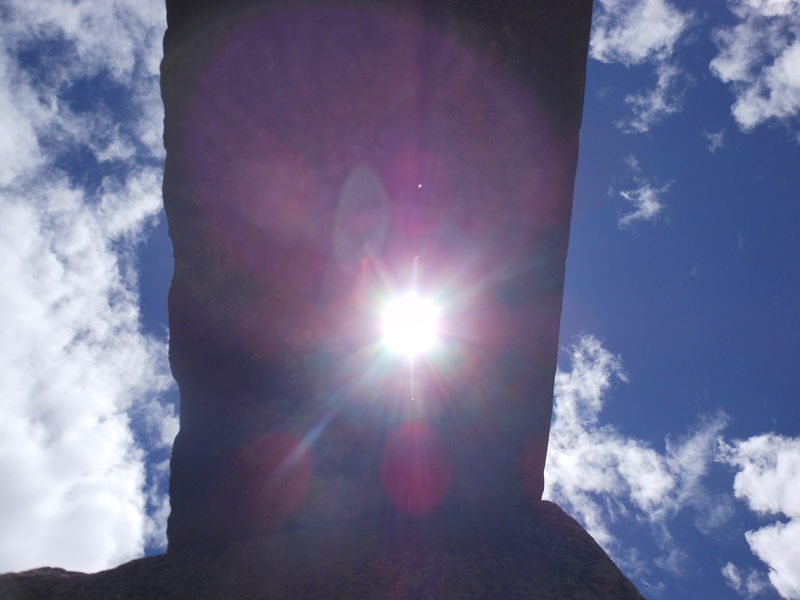 The shot below was taken at the Incan ruins of Saqsaywaman, which is located right outside of Cusco. The family and I, along with our visiting sister-in-law were in the area to visit Machu Picchu. More details on that day of our trip can be read here. 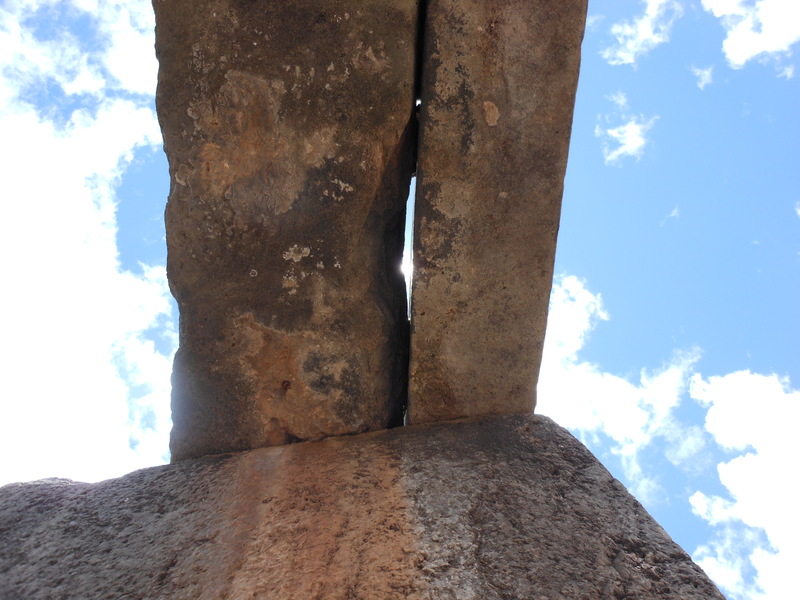 While touring the ruins, I came to a stone archway and as I looked up, I saw that there was a gap in the two blocks that formed the lintel. I positioned myself in just such a way so that I could capture the sun coming through that gap and here was the result. When I stepped a wee bit to the left or moved the camera a smidge (a precise unit of measurement equal to 4 whits) to the right, this is what I saw. Funny how a change in perspective can really change everything. The theme this week from those who run the Photo Friday site is “crimson“. Ever since September when we had our car back in our hands and we took to the mean (and lunacy-filled) streets of Lima to maneuver around this fine city, we always knew the time would come when we would have an accident. It wasn’t the “if” it would happen that concerned us because that was a given (and trust me, if you could see with your own eyes how people drive down here you would understand of what I speak). It was the “when” and “how”. Would it happen at Ovalo Monitor? Would it happen at the beach? A parking lot was not my first choice for where I thought our initial fender-bender would take place it, but that’s where it was. Cutting to the chase (which is an appropriate metaphor when speaking of an accident), we had parked the car in an underground parking lot so that we could have lunch at a restaurant in the Miraflores district of Lima. While departing said lot, the ramp to leave had an incline and a hard corkscrew turn to the right. While doing the best to keep the left-hand side of the car away from the narrow (and slowly closing in) walls, [name removed]** failed to notice the right-hand side of the van drift ever closer towards the opposite concrete wall until…. 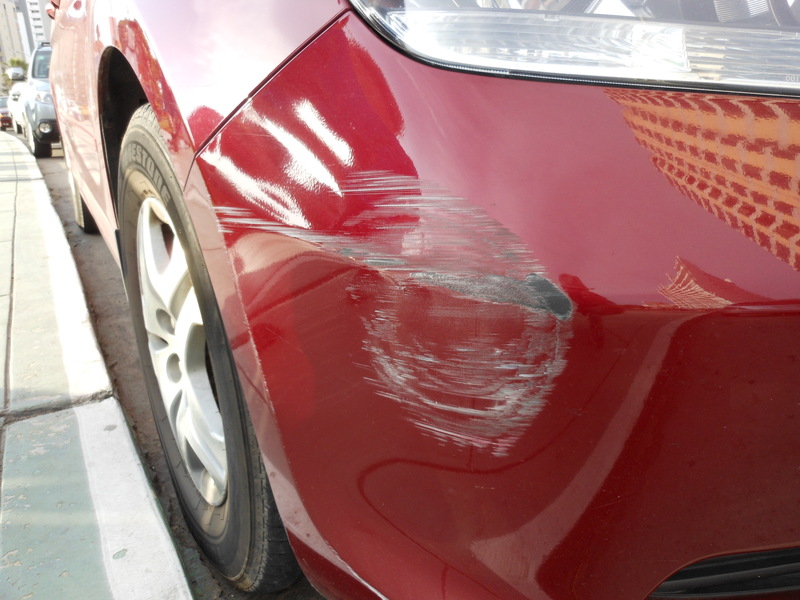 …and we were left the scratches, dings, dents, and scuffed paint that you see in the pictures above. 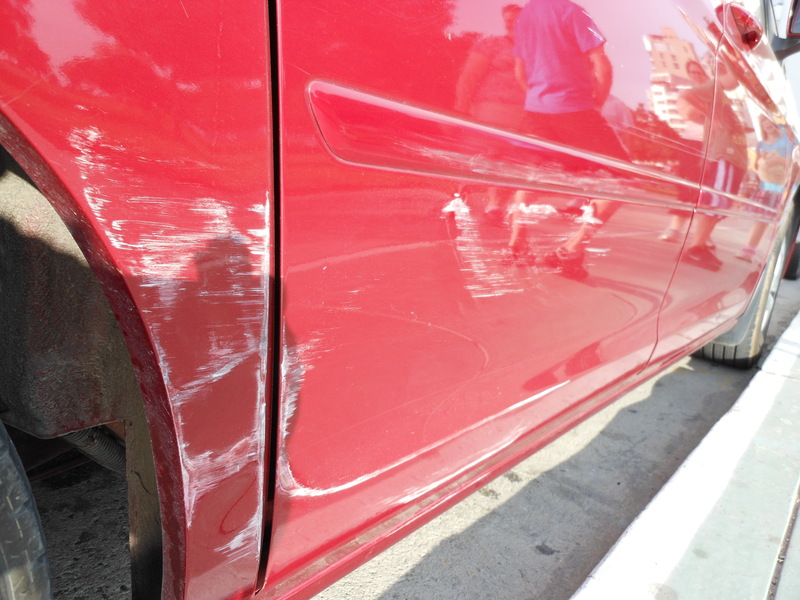 We have added our crimson coating to the collection of paint we noticed on the parking lot ramp and our car now wears with pride its Peruvian battle scars. **=The name of the driver of the car during the time of the accident has been removed from this posting, because it is not important to the story. Really. It’s not. This post is about a photo with a theme of crimson so does it really matter who was driving the car. Nope. Not at all. Nothing to see here, folks. Move along. Hey…let’s link over here. The above quote is brought to you by the literary device known as foreshadowing. This late morning, on this fine Wednesday (the 56th anniversary of the civil ceremony wedding between Monaco’s Prince Rainier III and Grace Kelly…my nominee for the most beautiful woman to ever grace the silver screen), I arrived back home after a trip to a local park to enjoy the sunshine and to attempt to take pictures for this here bloggy-thing. I entered the house through a side door that leads into our laundry room. As my feet crossed the threshold and fell upon the hard floor, I heard a squish sound. Not the typical aural greeting I expect to hear, but as this was the laundry room, my mind leapt to the conclusion that some water had been spilled from the sink or that a particularly wet batch of clothes had deposited their excess moisture on the floor as our empleada, Ethel, moved it to the dryer. No worries, I thought. I continued to walk into the hallway adjoining the laundry room and kitchen yet the squish sound persisted in following me. 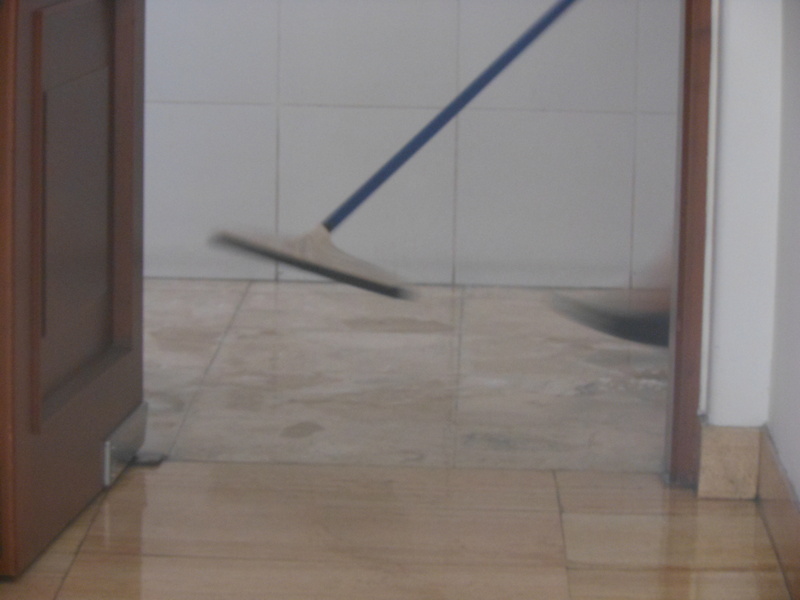 A floor so clean, I can see a reflection in it. Running back to the laundry room, I turned off the washing machine which was the culprit of the mini-deluge (the same troublesome appliance that has the temperature dial reversed). In the picture above, the black hose that was the real guilty party is back in its place. 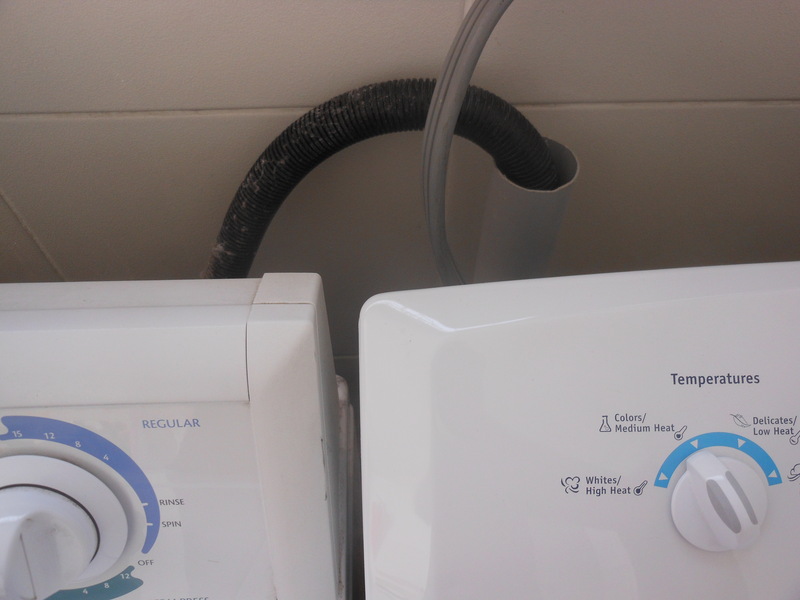 This piece of tubing draws water out of the washing machine and empties it down a drain. For whatever reason, the hose slipped free, fell to the ground, and began discharging H2O (also known as the extremely dangerous dihydrogen monoxide) all over the floor. 00000001) There is not a lick of carpeting on the level of our house that contains the laundry room. 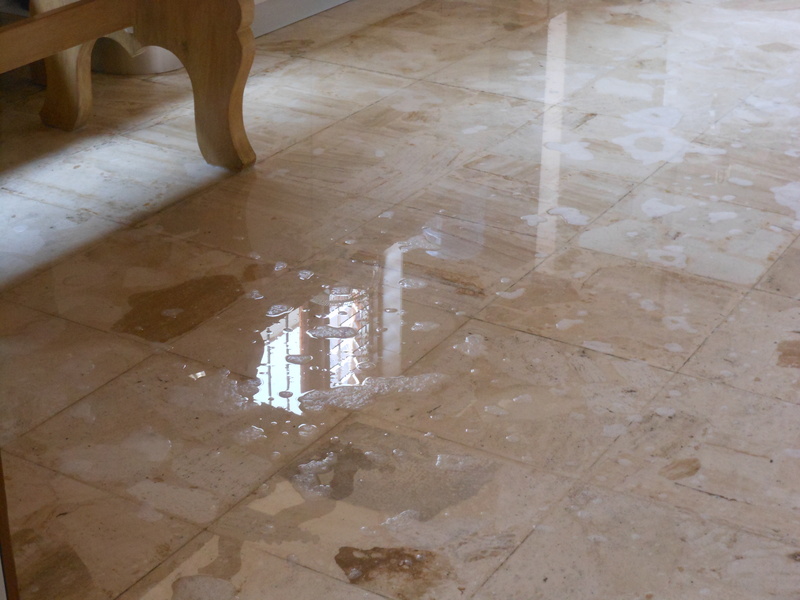 Cleaning up a flood on a hard tile floor is one thing, but quite another (overturned) kettle of fish when carpet is involved (and by “involved”, I mean mold and its accompanying odor). 00000010) We have an empleada. In just under ten minutes, she and Blue Bart (my completely on-the-spot made-up name for the squeegee) had corralled and pushed all the water out the door and onto our side patio. Much quicker and much better than I ever could have done. Now I simply need to find a way to keep the hose from wandering again. I am luckier than most folk who come down to Peru to travel or to live in that I already know a smattering of Spanish before I arrived. My parents, in a fit of brilliance, enrolled me in a Spanish language course when I was…um…too young to actually now remember when it was. I’m going to go with third grade and they can chime in and tell me I’m wrong. Growing up in Southern California as I was in the 1970s and with its large (and growing) Latino population, it was always helpful to have some proficiency of Spanish in your back pocket. From that course onward (and the cobwebs of my memory are somewhat clearing and so I want to say that the initials of the outfit were PFLS…but that was over thirty years ago so who knows if they’re still in business), I took Spanish in middle school, high school, and for one year in college. However, my joke is that my level of Spanish is just enough to get me in trouble in a bar. I know enough of the basics (some nouns, some verbs, not enough conjugation) to ask where the bathroom is, how much an item costs, and is the fish good today. Because of my lack of complete understanding of the language, I find myself in an interesting position when in a conversation. I find that while I am chatting with someone and they are speaking in Spanish, I have to pay complete and total attention to what they are saying. I know this sounds a tad odd, but when you are engaged in a chat with someone, be honest, part of your mind is off wondering what you will make for dinner tonight, how the Lakers could improve their free-throw shooting, whether your conversation companion notices the fleck of spinach in their teeth, or whether you have spinach stuck in between your teeth. One hundred percent of your brain is not actively involved in the conversation. Enough of the grey matter is invoked so that you can continue the conversation intelligently, but not all. I can suffer no daydreaming in Peru when I chat with someone and I have to use Spanish. I have to give my total concentration to what the person is saying because I do not understand the words as they come out of the person’s mouth. My brain works overtime as it has to hear the words and then run those sounds through its translation engine. This has to happen quickly because while I am understanding the first sentence of what was said, the person is already on to the next sentence. This is odd. This is difficult. This is quite hard. I truly wonder what it’s like to hear a word a Spanish and instantly grok it without having to run through my translation engine. End Side Note: The only other time I have had to focus 100% of my brain while listening to people gab was when I worked in Cubicle-Land and I would be designated as the scribe for meetings. When you are the one taking the notes during a staff pow-wow about the status of each person’s project, who will take what action, and whose turn it will be to buy donuts for next week’s get-together, you cannot wander off in daydreams for even a second…even if you know Metta World Peace can up his FG% if he were to shift his right foot just a bit while on the line.